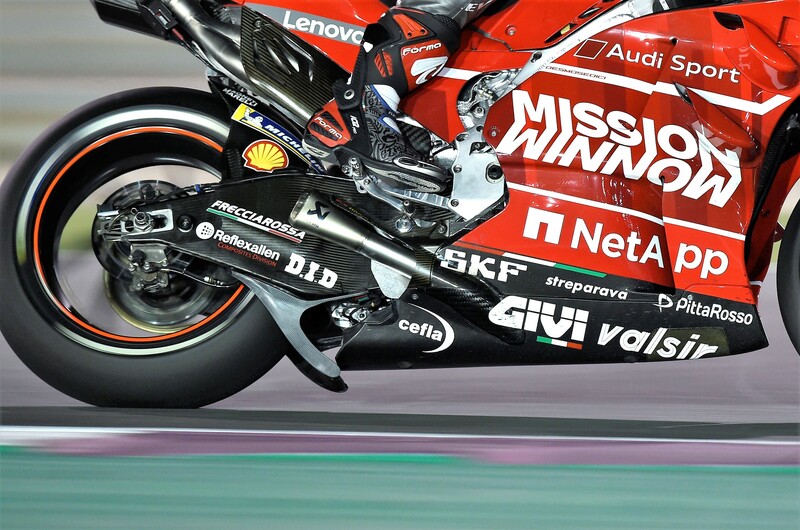 Earlier this week, the MotoGP Court of Appeal confirmed Andrea Dovizioso as winner of the season-opening Qatar Grand Prix by rejecting a protest made against Ducati's swingarm spoiler by Honda, Suzuki, Aprilia and KTM. The four manufacturers had protested the machines of Dovizioso, team-mate Danilo Petrucci and Pramac's Jack Miller on the grounds that the spoiler was 'primarily an aerodynamic device and therefore not compliant with the MotoGP technical regulations'. Ducati, which had already received the green light from Technical Director Danny Aldridge, insisted the device was designed to cool the rear tyre. The protesting manufacturers claimed their goal was not to strip Dovizioso of victory but to clarify the rules regarding what is and isn't allowed, in an area of the bike outside of the 'Aero Body' fairing regulations. But the Court not only confirmed the race results as final, but also rejected a request to ban the device from future use. Yamaha, which created a similar spray defector for wet races last season, was the only MotoGP manufacturer not involved in the protest. On the eve of this weekend's Argentine round, Ducati Corse general manager Gigi Dall’Igna - accompanied by sporting director Paolo Ciabatti - gave his first comments since the Court of Appeal victory. Ducati had been cleared to use the device on the basis that its purpose was as a 'tyre cooler'. As reported, that was backed up by evidence from MegaRide at the Court of Appeal, but on Thursday Dall’Igna made some figures public. "It works to put some air on the rear tyre and the results of our tests, at the Qatar test before the race, is that we can reduce the temperature of the tyre by about 7 degrees on average," he said. "This is, in Ducati's opinion. for sure an important result in terms of the performance of the bike." But the wing-style shape of the device meant Ducati's rivals were sure it created downforce and was 'primarily an aerodynamic device '. Dall’Igna conceded that the device had a 'secondary' aerodynamic effect, as would be the case for any part exposed to the airflow, which he listed as a meagre 300 grams of downforce at 180km/h (however the MotoGP top speed record is 356.5km/h, and downforce from the device would increase accordingly). "Also the water spoiler that Yamaha used at the end of last year had this secondary effect for sure. In our case, I think that we can tell you that we have more or less 3-4 Newtons at 180 km/h, 300 grams more-or-less." Because the purpose was cooling and the downforce effect so minimal, Ducati hadn't even done any wind tunnel testing for the part. "Honestly speaking, we didn't do any wind tunnel testing with the system, because our target was not the [down]force of the device. It was only the thermal effect on the rear tyre. "So we produced our results in terms of tests, during the Qatar tests, with the proper test on the race bike, and our simulations in terms of coefficient of heat exchange with the rear tyre." While the device had previously been tried by Pramac's Jack Miller and team-mate Danilo Petrucci, Dovizioso didn't fit the 'cooler' until warm-up in Qatar. Why? "In reality, it's also related to the durability of the system. Because we have not a lot of experience with this system, because we started to use it only during the Qatar test. "So we wanted to be sure that we didn't have any kind of problems on Dovizioso's bike before taking the decision to use it with him. Because it was clear since the Qatar test that the result which we achieved with these parts was good in terms of cooling the rear tyre." Cooling of the tyre is also far less important in qualifying compared to the race, but extra downforce (if that had been the main purpose of the part) would be welcome in any session. It had been Yamaha's 2018 spray deflector that had inspired Ducati's tyre cooler, which Dall’Igna in turn expects will now appear on other machines. "Ducati had this idea copying Yamaha. Because Yamaha used a system like this in Valencia and maybe also before in some practices, but for sure during the Valencia race. So Ducati had this idea to watch what another of our competitors are doing. So I think that the others will copy us [now]." Aprilia had been one of the key architects of the protest after claiming its own plans for a similar swingarm device were turned down. "Honestly speaking, I'm not sure that they presented something to the Technical Director," Dall’Igna said. "I think that they only sent an email to the Technical Director in order to understand if they have to homologate the water deflector like Yamaha was using in Valencia. But I didn't see any parts. "But you have to speak with Aprilia and with the Technical Director about that. I read something during the hearing, so I have my idea, but I cannot tell you everything, because it's not on the paper of the hearing." Dall’Igna challenged the assertion that Dovizioso could have kept his victory had Ducati lost the Appeal, as its four rivals suggested. "If the protest was accepted in Qatar, the disqualification of Dovizioso and Petrucci would be sure," he said. "Because the result of a protest is disqualification of any riders that used a bike that did not conform with the rules." Instead, the Court's verdict proved that Ducati had "read and interpreted the rules in the proper way. This is not only the Technical Director's point of view, but also the Court of Appeal's point of view that had the possibility to read not only our documents but also the documents of our competitors." The fact that Ducati had to reveal its tyre cooling knowledge to its competitors during the Appeal clearly irked Dall’Igna: "I think this is for sure not fair and not the best way to do things in motorsport". If Ducati had lost the Appeal, not only would Dovizioso have been stripped of victory but, in Dall’Igna's view, it would have had major repercussions for MotoGP since the decision of the Technical Director could be overturned. It was for that reason that Dall’Igna said that he had spoken of possibly protesting the Honda fairing. "This was just provocative, to show what could be the scenario if this appeal was not rejected," he said. "Because if we have one Technical Director that is the only judge about the technical things of the bike and if we kill this we have simply no rules. It's like the Wild West without the Sherriff!" The Italian, who has transformed Ducati's fortunes from five winless seasons following the departure of Casey Stoner to finishing title runner-up for the past two seasons with Dovizioso, also took on the much-trumpeted phrase that aerodynamics is a bottomless money pit. "Ducati Corse spends only 1% of our budget for the aerodynamics. So if we cut something there it is ridiculous in comparison to the other costs of MotoGP," he said. "We spent, for the lawyer and everything at the Court of Appeal, something equivalent to five days in the wind tunnel. In 2018 we developed our fairing, our MotoGP bike with ten days in the wind tunnel. "So 50% of the aerodynamic wind tunnel budget is gone only for the Court of Appeal." Dall’Igna also believes the fee for issuing a protest and appeal should be higher. "I think that the cost of the Appeal is too cheap. €1300 for the appeal, and €600 for the protest. So I think it's nothing if you compare it to the total cost of the Court of Appeal." But Dall’Igna offered an olive branch to those that protested his device and called for all six manufacturers to work together to produce clearer rules, where needed, within the MSMA. "We at Ducati believe that now we have to close this chapter and look forward to try to be more close with our competitors, with the other manufacturers in the MSMA, to develop as much as possible this championship and - if it's possible - to clarify or change any rules that are not properly written or can be better written. We are always open to discuss with our competitors regarding that." But there seems no simple solution in terms of clarifying rules that depend on 'primary' and 'secondary' effects to determine legality. The swingarm device is just one of several new innovations Ducati has developed recently, alongside a torque bar mounted to the rear brake, rear seat aerodynamics and a holeshot device. "I'm here to develop the bike, and Ducati is here to develop the bike and to improve their knowledge in vehicle dynamics, engine, electronics and aerodynamics. So we have to develop. This is our job, each race," Dall’Igna said. Free practice starts in Argentina on Friday morning.